I don’t usually devote a full post to miscellaneous stuff like this, but I thought this was especially cool and haven’t seen any other blogs reference it. 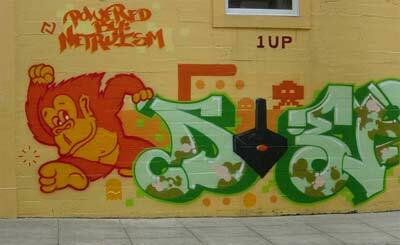 I found this cool retrogaming-themed graffiti on Flickr today. That looks more like a legal mural, being so high quality and so big. But I like how it’s graffiti styled. That just go’s to show how much of an influence games had on different people. If you want to see more urban style art check out iam8bit. You probably seen it already but if not check it out, the work is amazing.